The article presents one of the psycholinguistic meaning’s types, offering the screen model description of all its components: denotative, connotative, and metalinguistic. Metalinguistic component of screen model is discussed in detail. Keywords: psycholinguistics; semantics; psycholinguistic meaning; semantic interpretation. The paper deals with the use of copular verbs in different types of impersonal sentences, and explores the reasons influencing the ability of copular verb for participating in impersonal structures; the historical overview of various copular verbs’ impersonal usage is also presented. Keywords: impersonal sentence; copular verb; semantics; distribution. Russian adverbial participles are unprecedented complex grammatical phenomenon, having no formal analogue in Chinese. While translating this grammatical unit, the translator in order to achieve some equivalence must transfer not only its grammatical meaning, but also its pragmatic aspects. This article represents the main pragmatic aspects of translating Russian adverbial participles into Chinese. Keywords: pragmatics; grammar; Russian adverbial participles; translation; Chinese; equivalence. The article is devoted to peculiarities in functioning of one-part definite-personal sentences in the novel “Tomorrow There Came War” by Boris Vasilyev. The author offers a classification of the speech acts, in expression of which these definite-personal sentences take part, describes the situations making different speech acts possible, and comments the relations between addresser and addressee. Keywords: definite-personal sentence; speech act; addresser; addressee. The article deals with the Russian proverbs from the “minerals” thematic group, taken from the “Explanatory Dictionary of the Live Great Russian language”, compiled by V. I. Dal, and the proverbs dictionaries by M. A. Rybnikova and V. I. Zimin, analysing proverbs with the lexemes ‘diamond’, ‘granite’, ‘clay’, ‘iron’, ‘gold’, ‘stone’, ‘sand’, ‘silver’, including their cultural codes (the natural and landscape, the anthropic, the somatic) for the purpose of identification and description of the construction material, corresponding to the cultural sense of the proverbs’ figurative structure. The author concludes that these proverbs reflect people’s ancient wisdom, their observations on surrounding natural objects and human beings relationships. Keywords: language; speech; culture; dictionary; proverb; minerals; natural and landscape code of culture. The article analyses the process of «restoring» the text with missed words, proving that the texts’ fragments with a clear, corresponding to the readers’ life experience “picture” are easily restored. The linguistic stereotypes, by the part of which the whole sentence can be recalled, also maintain the right choice. The difficulty emerges in the search of the words that reflect the attributes of distant epoches with their turns of speech. The layer of specific to the author expressive mean and metaphors is well-defined, since they can be hardly restored. Keywords: close texts; text restoring; linguistic stereotypes; culturological competence; metaphors. The article considers the techniques of creolization, applied in contemporary emotive prose and media texts. Revealing the potential of creolized text allows the authors to catch readers’ attention, to create richly informative and meaningful statements, broad contexts, to realize the implications and connotations. Keywords: creolized text; techniques of creolization; discourse. The article deals with the medicine as a part of human culture, associated with health and disease, treating a medical doctor as creator of the culture and language. The authors offer historical and biographical overview on physicians, the writers and the collectors of epic songs, analyze the intermingling medical and literary activities, compare medical and scientific ways of reasoning. The article also contains critical analysis of some discrepancies in the use of medical terms, and mistranslation of foreign medical terminology into Russian, mistakes in the use of medical terms, including the eponymous ones, by the representatives of various national medical schools and various professions. The paper analyzes the crisis in medical terminology, asserting that the medicine, unlike other natural sciences, still has no professional sub-language and consistent thesaurus for all its branches. The article also contains historical comparisons, reflecting the evolution of professional medical spoken and written language in Russia. Keywords: medicine; medical sublanguage; special terminology; eponyms; language borrowings; translation; history of medicine; medical education; culture of speech; globalization; stress; shock; bile; investigation; research. 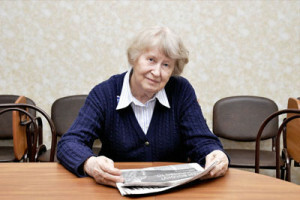 The article describes the usage of the widespread reduced form ‘shchas’ in Russian speech. This form has got implanted in colloquial speech, and now is widely used in written texts, and even has received a lexicographical fixation in regulatory dictionaries. In a number of its usages in everyday speech the word loses its lexical meaning and acquires pragmatical one. It testifies the process of lexicalization of the reduced form and allows to trace the stages of the transition of this form from speech to language. Keywords: Russian spontaneous speech; principle of economy; phonetic reduction; short (reduced) form; Russian speech corpus; Russian national corpus; lexicalization; pragmaticalization. The article analyzes the possibilities of comparative teaching of Russian culture in the age of globalization. It provides a detailed overview of the course on Russian-American cultural relations, offered to the students at the University of Colorado. The article focuses on the role of the Russian-American summits, a practice which originated in the 19th century, after the visit of Grand Duke Alexey Alexandrovich to the United States in 1871–1872. Keywords: Russian culture; comparative teaching; Russian-American relations. The article studies the epic tale picture of the world through the prism of the polysemantic folklore “nuptial” code. The investigation of the epic tale picture of the world is carried out considering the re-coding and re-semantization of the mythological, ethnographic and historical material. The wedding in the epic tale picture of the world symbolizes the beginning of a new life for the warrior hero (“bogatyr”) or the country. A nuptial feast in an epic tale reveals the incompatibility of the alleged spouses, and results in a tragedy or restoration of the previous marriage. Keywords: folklore picture of the world; folklore linguistic picture of the world; epic tale picture of the world; folklore code; “nuptial code”. The author asserts that the proverbs convey the people’s perception of the world and its fragments, doing it indirectly with the help of stereotypes and etalons. The article compares the proverbs, representing the concept of fortune / misfortune in different verbal realizations, attempting to detect specific features of the symbolic meanings in the etalons. Keywords: proverb; fortune; misfortune; concept; linguoculture. The author asserts that the proverbs accumulate unwritten rules and culturally motivated models of behavior in society, giving them evaluations; they represent a valuable material for observations of universal and national features of different cultures. This paper is devoted to linguocultural presuppositions of Russian proverbs about the “The Host Receiving Visitors”, perceived by Chinese speakers, and discloses the differences and similarities between two cultures. Keywords: proverb; linguoculture; host; Russian and Chinese proverbs. This article examines the motif of the hill in three Russian poems written in the 2nd half of the 20th century. Each poet is seen as creating his own hill, but at the same time in all three texts the hill serves as a metaphor for the place where that happiness and harmony can be achieved that is the common objective of humanity. The commonality of purpose thus revealed can be seen as the overarching theme of Russian poetry, which proclaims that the most important thing in the life of man is the achievement of personal Happiness. 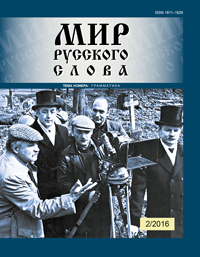 Keywords: twentieth-century Russian poetry; lyrical ego; motif; sung lyrics; Leonid Aronzon; Boris Grebenshchikov; Ilyia Kormil’tsev. The article deals with some problems of improving and evolving of basic dictionaries’ gradual series. The research is focused on representation of prepositions as an important part of speech within basic dictionaries of different levels. Keywords: preposition; basic dictionaries; Russian as a foreign language tests. The article is focused on topical problem of developing a national-oriented methodology of teaching Russian language for foreigners, which is prejudged by a requirement of integration of students’ cultural-national specific. The author considers specificity of a Russian language textbook for Thai students, written on the base of national-oriented model of teaching in non-linguistic environment. Keywords: national-oriented model of teaching; non-linguistic environment; textbook for Thai students; Russian as a foreign language (RFL); basic level. The article describes the motivation for learning Russian language in Estonia and Hungary. Independently conducted studies and the analysis of their results prove that main motives of different categories of foreign students are pragmatic and communication ones. The authors suggest that the majority of foreign students studying Russian outside the language environment have similar motives. These reasons should be taken to consideration in the future, and should determine the whole process of teaching Russian and be regarded as decisive in selecting educational material, system, forms and methods of teaching. Keywords: motives; motivation; sociological survey; image characteristics; stereotyping.